Displaying her work at some of the world’s most prestigious design fairs, Norwegian designer Kristine Bjaadal recently unveiled her second exclusive edition of the Sfera bowl during Stockholm design week. Since its launch in 2016, Bjaadal’s Sfera bowl has travelled the world gaining huge interest and drawing widespread attention featuring in numerous respected interior design publications such as Wallpaper* and different Norwegian interior Magazines and newspapers. Unveiled for the first time during Milan design week in 2016 as part of the Norwgian Structure, Ventura Lambrate, the Sfera bowl was produced in a limited edition of 5 and this year, during Stockholm design fair, the Sfera II was launched as an exclusive edition. Sfera is a stone casket made of a 300 million years old Larvikitt. It gives me a certain awe. 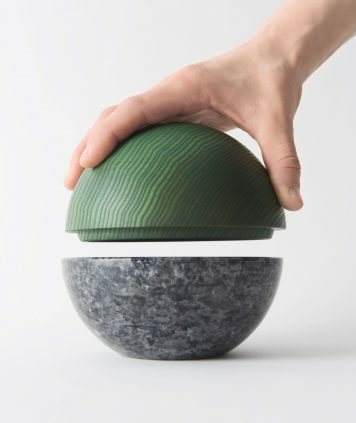 Made from the unique Norwegian mineral Larvikite, the beautifully designed spherical container blends Lundhs Blue and ash wood to create a stunning piece that can be seen as either a standalone sculpture or a stylish yet functional container for everyday objects such as jewellery. 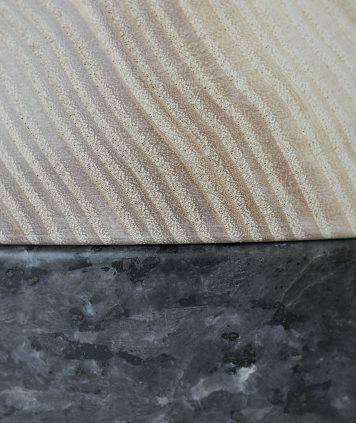 Both materials are structured with traces of the past. Made up of distinctive feldspar crystals, Larvikite tells a story of natural creation from nearly 300 million years ago whilst the distinctive markings in the ash wood tell a story from a not too distant past. Kristine Bjaadal is an Oslo-based Norwegian designer whose work combines the functional with the sculptural, often imbuing even the most commonplace everyday objects with near-poetic beauty. Her practice is driven by the desire to turn daily routine into rituals that can be appreciated. Bjaadal explores the human inclination to collect memories and keepsakes, which has resulted in the creation of different kinds of containers. Containers are no longer limited to their practical function, but can even tell a story about keeping things that are dear to us. 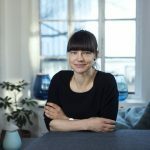 Since she set up her studio in 2010, Bjaadal has exhibited internationally and her work has drawn widespread attention.